Did you miss this awesome post full of 2-weeks worth of REAL FOOD recipes?! We’ve got some seriously SMART and KITCHEN SAVVY peeps in our writers group and Jess Baumgardner aka “Health Coach Philly” has some magic in store for you! Add liquid and greens to blend first – really well! Next, add pear, pineapple and mint and blend. Last, add banana and lemon and blend. Frozen banana will give you more of a “smoothie” consistency. Benefits: This smoothie has fruit and veggie fiber that will keep you feeling full, so you aren’t snacking on packaged junk. The coconut water helps to prevent dehydration, which manifests as hunger and typically causes extra calorie consumption. As it is heating, add a tsp of vanilla or almond extract and a dash of cinnamon and/or nutmeg. When all liquid is absorbed, fluff with a fork and add to bowl. Top with drizzled maple syrup to sweeten. Top with fresh organic fruit: blueberries, strawberries, banana, peaches, cherries, etc. Supercharge with a superfood: sprinkle chia or hemp seeds, pumpkin seeds, coconut shavings, cacao nibs or goji berries. Benefits: Quinoa is a gluten-free, complete protein with all amino acids and plenty of fiber/protein to keep you fueled and full during your busy day pre-lunch hour. Like cereal - it’s sweet. 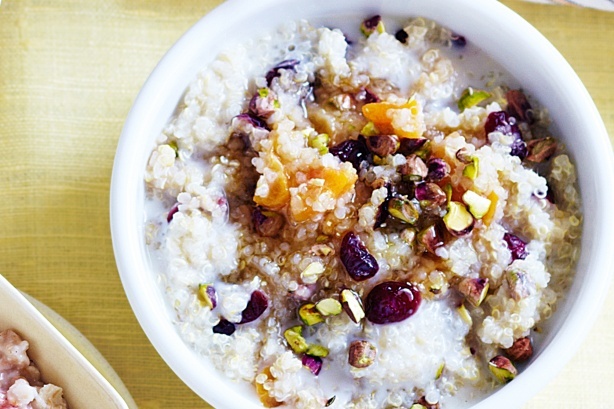 Unlike cereal - it doesn’t require refined sugar, which packs on the pounds! Rather, you can just top it with fruit (yay!) or a tiny bit of maple syrup. The ingredients below will give you 1-2 servings, so you can double and triple this recipe to make a batch for the week if you like it. Combine all of the dressing ingredients in a high-speed blender and blend until completely smooth. Pour over chopped Romaine lettuce and toss well to coat. Serve with roasted potatoes as "croutons," if desired. Leftover dressing can be stored in the fridge for up to 3 days. Benefits: In this salad, you are getting all the flavor of an old favorite - without the guilt! 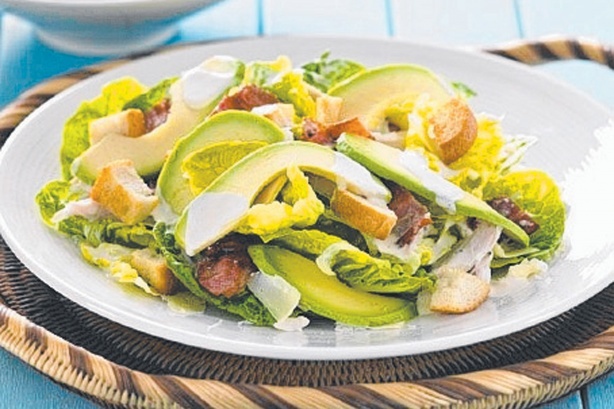 We are replacing a heavy, digestion-disaster dairy-based dressing with avocado. Plus, the avocado provides your body with healthy fats! Cook brown rice (instructions on package). Heat a large pan to medium. Add coconut oil, then onion, garlic and curry paste and cook 5 minutes until soft. Add coconut milk and vegetable stock and bring to a simmer. Stir in the corn, shrimp and spinach. Cover and simmer over medium heat until the shrimp have cooked through (turn pink), 6-8 minutes. 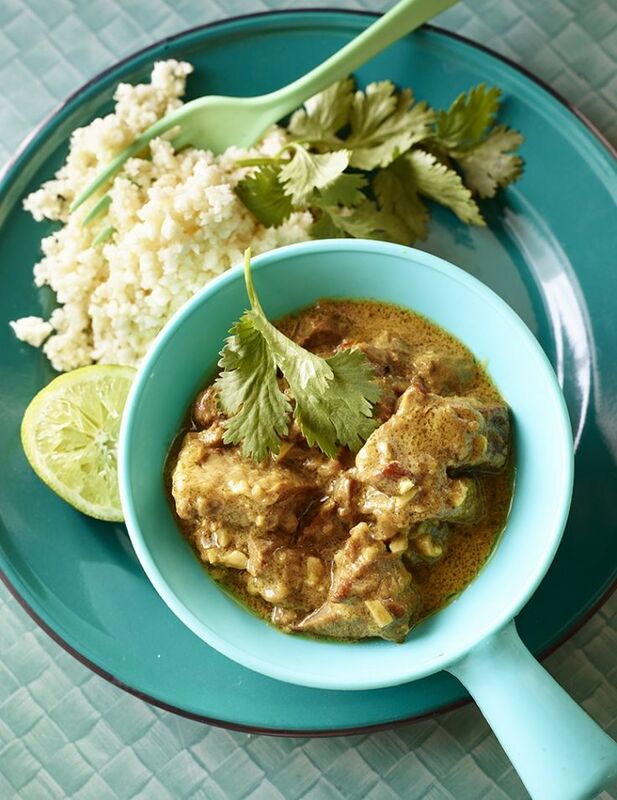 Serve the curry over 1 cup of cooked brown rice and top with jalapeno, basil and squeeze of lime juice. Benefits: This dinner is SUPER easy for your busy weeknights. It’s gluten and dairy-free to make for easy digestion and easy digestion = more weight loss. In a bowl, add the coconut milk to the cashews and soak for 1-2+ hours. Add the coconut milk, cashews, garlic, ginger, jalapeño, curry, turmeric, onion powder and salt to a blender and blend until smooth. Optional: if cooking chicken – cut chicken into cubes and season with salt and pepper. Add coconut oil to a pan over medium heat and add chicken until cooked through. Set aside. Add coconut oil to a pan over medium heat. Add vegetables and cook until soft (3-5 minutes). Add cashew sauce to the pan (and chicken, if you are using this) and stir everything together. Add water if the sauce is too thick. Heat through and serve with cauliflower rice (recipe below), brown rice, basmati rice or quinoa. Break off florets of cauliflower, rinse and pat dry. Use a food processor or grater to turn the florets into “rice.” In the food processor, pulse half at a time until finely chopped, dump out and then process the other half. Option 1: Heat a large pan over medium to medium-high heat and swirl coconut oil along the bottom. Add cauliflower and a pinch of salt and cook for about 5 minutes until it starts to brown. Depending on the amount of cauliflower you have - you might want to do two batches. Option 2: Preheat oven to 425 and line a baking sheet with tinfoil. Add the cauliflower and pinch of sea salt to a large bowl. Melt the coconut oil and add to the bowl, making sure all of the cauliflower is coated. Place the cauliflower on the baking sheet in a single layer and bake for about 25 minutes until nicely browned. 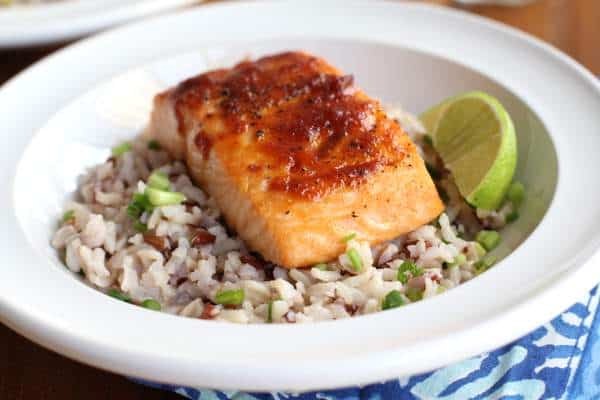 Benefits: In addition to being dairy and glutenfree – this dish, quite simply, prevents you from ordering TAKEOUT where you really don’t know WHAT you are getting in your meal! Added sugar, salt, preservatives, chemicals, oils, etc. are lurking in your favorite takeout dinners and adding to your waistline. Take your cravings and create your own version with ingredients you can trust. Also – if you already have a carb-heavy diet, replacing the rice with cauliflower keeps your dinner lighter and will help pull some carbs out of your everyday.